I like retro computers. A lot. While working on my BL-328 project, I snagged my old Tandy TRS-80 Model 102 portable computer, to use as a serial console for it. Long story short, using it as a serial terminal works great, I just had to throttle the baud rate back to about 1200 baud so that it can keep up. Because of this, I decided to get back into playing with my Tandy 102 a bit, seen above. I resubscribed to the M100 mailing list, which is associated with the Club 100 "Model T" Users Group. They nicknamed the Model 100 and 102 as the "Model T", as in the car, which is an appropriate analogy I think. I had been subscribed to this in the past, and I really liked the people, their attitudes, and their ethics. It's as though someone freeze-dried a computer enthusiast group from the late 70s/early 80s, and defrosted them now. It has an 8 line, 40 column LCD display. It's got the date in the top left, usually "(C)MICROSOFT" in the top right, since the firm/software was written by Microsoft by a guy named Bill Gates or something. (This screenshot is from the emulator, so it appears a little different than actual hardware.) The memory free in the bottom right, and the Select prompt in the bottom left, so you could just type in your selection. The middle area lists all of the files and programs in the ROM, mixed together. 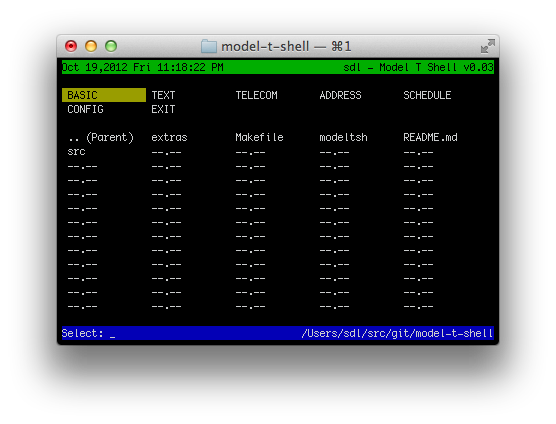 I have started up a project on github called "Model T Shell", and have been exploring this. It is by no means finished, but I thought I'd bring you along while I experiment and hone the interface to something that makes sense and is reasonably usable. I started out by doing the basics of it. It uses curses/ncurses/pdcurses, builds with gcc, and works on OS X (command line developer tools required), Linux (Ubuntu tested, requires ncurses), and perhaps in the future, a build on Windows/mingw. I took the interface, added color, and made it flexible with respect to the screen size. Top left has the date and time in the same format (No more Y2k bug!). Top right is version info and username of the person running it. Middle section is navigated with the arrow keys, selected with "enter". Select prompt in the bottom left, and "free memory" in the bottom right. I wasn't sure what to put in the bottom right yet, so that's just a fixed string for now. I added in a scanner for the current directory, and quickly realized that doing this was a horrible mess. I also had changed the bottom right to indicate what kind of 'thing' the selector was over. A directory in the above image. Next, I decided to separate it into three sections: Verbs, Places, Nouns. Verbs are actionable things. This includes builtin programs and commandables, and current directory's commandables (executables, shell scripts, runnable programs.) Places are basically directory navigation. Nouns are things that can be loaded, edited, and such (files). This seems to make sense for using. As you navigate around the directories, everything sorts as you would expect it to. Next I'd like to change it such that the commandables and places have editable lists. That means that as you navigate around and find verbs that you like, you can add them to your verb list. Likewise, you can add places that you like to work from and store them there in that list. 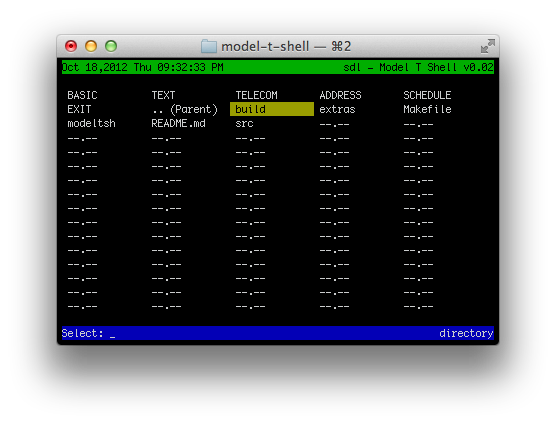 I also need to figure out how to let you select commandables for different files. I'm thinking maybe keying off of MIME types, or just more simply, file extensions. That way, for example, you could open .do or .doc files in PICO, but .txt files in VI or EMACS or whatever. Oh, and it should also probably do something rather than just letting you navigate around the filesystem. I don't see there being a final product, a single deliverable to achieve on this project... 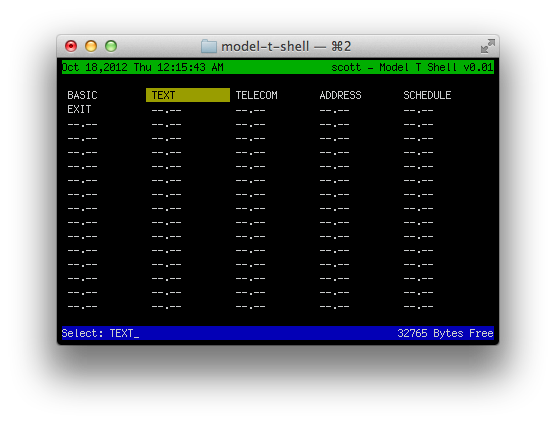 It's more of an exploration of how an interface like this might work for a modernish system. I'll post an update when I figure things out more.